Not sure what you call them. But in UT Canada, the ground textures in these small sections are always a different colour or sometimes they have some lines running through them. As a result they stand out and are even more prevalent at night or in the winter time during the day, as shown below. I have no orbx products installed, I have not installed Orbx stuff in the past, but could it have something to do with the "UTXUSATextureUpgradeP3d" that I have installed? Been like this since installation, figured it was time to post. This is taken a bit northeast of Montreal. Not sure if the same exists in the U.S.
Firstly only UTX Canada has accurate power line and power transformer areas as part of the product as the data for this was available during its development. Without accurate lat/lon locations it makes it difficult to reproduce the exact issue you report so if you could provide them it would help. Will also need to know which date your system was set at on the flight to determine if this is a normal or hard winter underlying texture. That's not normal Jeff... although his image is FAR too small to see perfectly clear, the tile he is talking about is BLACK and from blowing it up here, although very blurry due to the size,.. it appears there is a NIGHT tile showing up during the day. He has issues for sure but I have never seen what the OP is showing in Canada/USA or Europe. apologies for the poor screenshot. There are a whole bunch of them around N45 39.05 W73 31.16 looking at a heading of 220. These are northeast of CYUL. Funny thing is when I slew to them and move up close, sometimes the dark black changes to a light grey, indicative of a more proper texture. As soon as I un-slew and fly normally, the black reappears and sometimes changes to back to grey. Night time its very obvious. 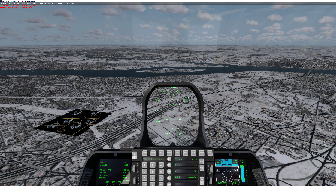 I checked at that location at various times of the year both day and night and while the winter texture is darker than the summer one, it blends well with the overall winter textures in base FSX (where I tested). Are you running any texture replacements from the shipping versions? Are you running in DX10 mode? Hi Jeff, thanks for the reply. P3d 4.5 But existed in earlier versions of P3D V4, just never got around to fully posting. I did ask about this at some other point. But I wonder if that texture upgrade package "UTXUSATextureUpgradeP3d" somehow overwrote a texture ? Can you point me to something I might be able to check within the UTX install, a specific texture or something like that. I don't think it has anything to do with scenery library order, I honestly do not see this anywhere else but Canada. It helps if I can get answers to the questions I asked in my previous post as those are what I think may be more relevant i.e. as the texture involved in the UTXUSATextureUpgradeP3d were for a different UTX feature and only limited to UTX USA they should have no bearing on UTX Canada, and scenery library order rarely have anything to do with textures. So, are you running any global texture replacements from the shipping versions? Are you running in DX10 mode? I will check the terrain.cfg and report back and compare it to what you have noted here. I checked the sim to make sure the three textures are there. No issue. Each file size is 4097kb, 2048 x 2048, DXT5 with no alpha, I've never modified or viewed these textures until now. I opened the textures with Imagetool and they open fine and they look good. When I slew up to the power stations, the ground texture is all black. If I hold stationary over the power station, maybe 5 to 10 seconds later, the correct ground texture appears. However, other power station ground textures in the same area are still black. If I slew to another power station and hold steady over top, the correct ground texture appears but the previous power station ground tile turns black. Sometimes, you can see what appears to be roads, or lines which appear to be roads, running through the black ground texture. The fact that the correct UTX ground textures do finally appear correctly after a period of time points more to a resource loading issue within the sim aplatform nd/or your hardware and not the texture itself which is just a static file. I have no idea why this is happening in P3D in your particular hardware/software case as others are not reporting this. Some posters reporting similar situations, not directly involving the same textures or UTX, but similar day/night texture problems. I may have a look and see what happens if I deactivate FlyTampa's CYUL. Also found this bit of information from the FlyTampa forums. Again, not exactly the same, but I wonder if that scenery is somehow conflicting with the power plant textures. I've posted at their forums. Come to think of it, I'm not sure I've noticed this with the power plants in other parts of Canada. I'll have a closer look. I need to find one far removed from any other scenery. I can now confirm this behavior. It appears to be either a direct P3D v4.5 issue OR there is a problem with the UTX power station tiles. It only appears to be the power station tiles. Night tiles are showing during the day from a distance and when approached they turn grey in any season which is why I did a P3D update and then reinstalled UTX clean. ... and I can ...suggest that there are KNOWN problems with the current version of P3D 'being looked at' Which means this could be something brought to the surface by recent P3D updates and was simply never seen in the past but, is a UTX texture problem. I am checking the graphics and will post back. GEX does not replace the UTX power station tiles so if it is the graphics its the UTX files here. I confirmed the issue is in fact the UTX graphics. The issue is the power station DXT5 graphics are NOT mip-mapped they are single images. Mip-mapping them corrected the issue. Why this may not have been seen in the past... It is possible some kind of recent (as in the last year) graphics driver change may have forced it to the surface. Also, this power station graphic is rarely used. I have seen the industrial oil and other landmark areas but I have never seen the power station graphic outside of Canada and only in certain locations in Canada. Had I seen this tile years ago I would have changed/edited it for GEX/GEP3D and mip-mapped it too. They should be added to all the UTX products. I will build a set for GEX/GEP3D because the defaults are far too bright and need some color work to blend with GEX/GEP3D... I will post them here too. Great stuff Nick, many thanks for the check! I'll be honest, I thought about the Mip-map problem when I opened the textures with Imagetool and having read the excellent tutorial posted here at SimForums many, many times. It's kind of like a bible to me in terms of resizing textures for my extensive AI set up - that, and better understanding how textures work. I went out and purchased Photoshop and added the Nvidia Texture tool and then spent 3 or 4 weekends, converting every single one of my textures to 1024 X 1024 as explained in the detailed tutorial. Just the space that was saved alone made it worth the effort. Now its much easier as every time I add AI, it's the same process repeated. I have Photoshop set up on a client and with shared permissions, can edit the FS textures and save them, all from the client. I've often wondered why there are any .bmp's at all to be honest with UTX Would it not be more advantageous to change all of them to .dds? At any rate, my personal thanks for following this thread and helping solve the problem! No... .dds is used for the P3D or FSX\TEXTURE folder or in texture folders for aircraft, scenery, addon scenery. The only 'main' difference between DDS and BMP with mip-maps,.. is DDS is flipped (like upside down and backwards sort of) although there can be other quality advantages but ONLY if the graphic artist knows how to make better quality at the SAME RESOLUTION.. otherwise your perf hit goes UP... the format itself is exactly the quality the texture artist makes regardless. The sim looks for DDS first in the texture folders and defaults to BMP. That happens so fast its not a performance issue. The DirectX system automatically flips the graphics in the pipe regardless of being BMP or DDS, so if I have all .dds then they are flipped twice instead of once. Aircraft and scenery models may call a BMP or a DDS directly. That can be defined in the model file. I gotcha, thanks again for your help Sherlock!